The 5,000 acres originally comprising both Newtown Borough and Township were part of the vast tract purchased by William Penn from the Indians by William Markham, Penn’s agent, on July 15, 1682. 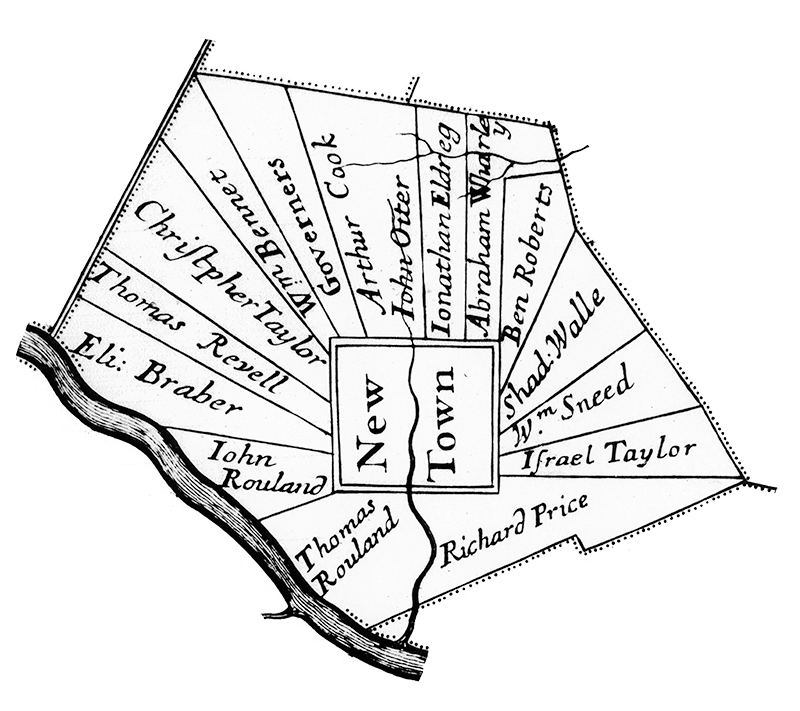 Penn originally called this area his “New Town” which eventually evolved into “Newtown.” The town was patterned to resemble an open fan surrounding a narrow rectangular piece of property called the town common. 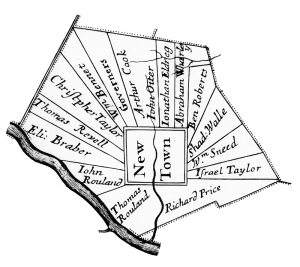 The plan of the township and townstead were surveyed by Thomas Holme in 1684 and the boundaries that appear on his map of that date remain essentially the same today. Newtown was the scene of some very important events during the Revolutionary War. On Christmas morning 1776, Gen. George Washington marched from his headquarters to join the Battle of Trenton. Gen. Washington made his headquarters in Newtown after the Battle of Trenton and the famed crossing of the Delaware River and before the Battle of Princeton, where he penned his two famous letters to Congress describing his victory at Trenton. The house that Gen. Washington chose as his headquarters stood on South Sycamore Street until it was razed in 1962, thus providing the motivation to form the Newtown Historic Association. Newtown was the County Seat of Bucks County from 1726 to 1813, before it was moved to Doylestown. During this period, this rural community grew into a prosperous governmental center, leaving behind its origin as an essentially agricultural village. Because a substantial amount of town and county business had revolved around the courthouse trade, taverns and inns became staples in the local scene. As the 19th century progressed, the community remained a busy commercial and cultural center for the surrounding farms. After the County Seat was relocated in 1813, Newtown was gradually transformed back into the tranquil pastoral town it once was. In addition to the many historic homes and businesses that line the streets today, one can still sense the industrial and agricultural activity that thrived here so many years ago. Excerpts from Historic Newtown – Images of America, C. David Callahan, et. al., 2001. The Court Inn (known as the Half-Moon Inn during the mid 18th century) is one of the oldest and most historic buildings in Newtown. 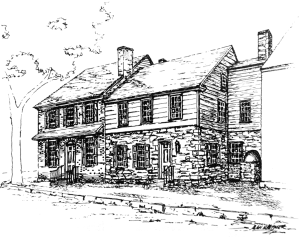 It was the original home of Margaret and Joseph Thornton, built in 1733 as a tavern, and was a popular gathering place when Newtown was the County Seat. 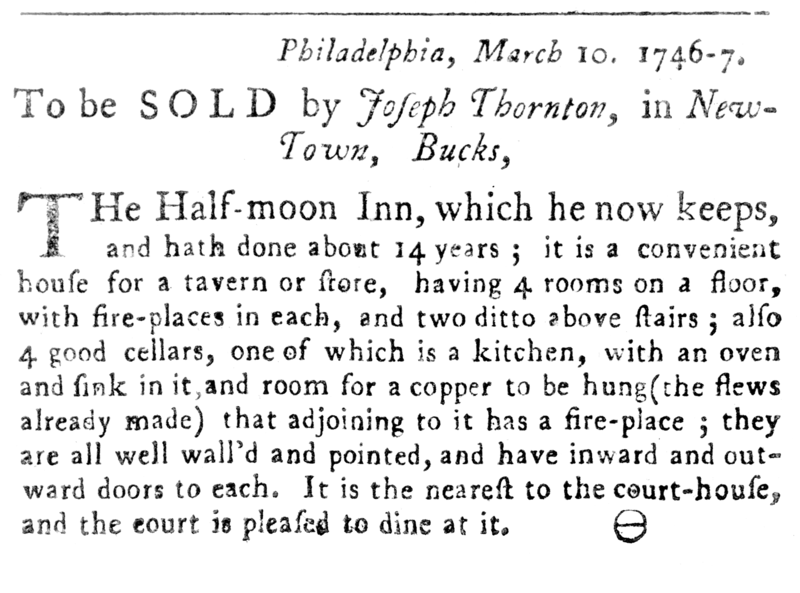 The Court Inn, originally called the Half Moon Inn, was built in 1733 by Joseph Thornton on part of five acres of ground originally purchased by four trustees, appointed by the General Assembly “to build a new Court House and Prison in the County of Bucks”. 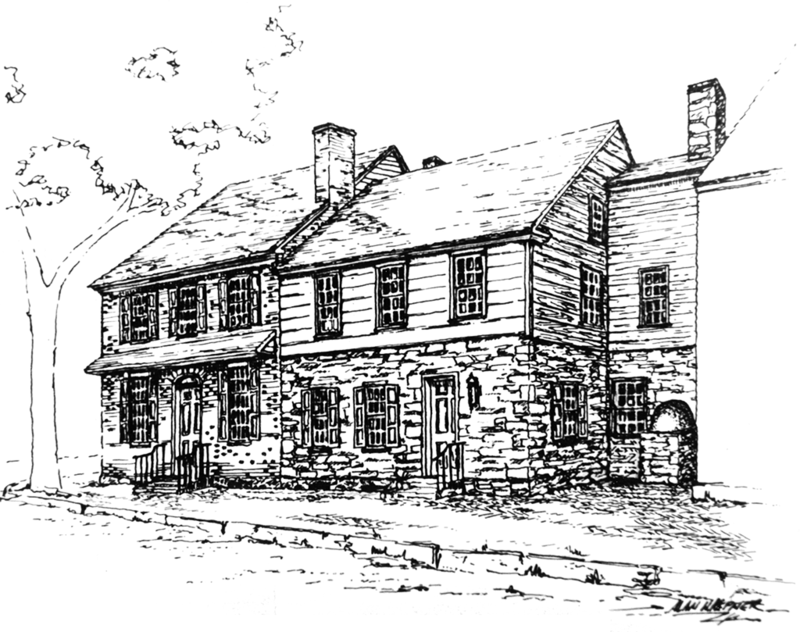 The trustees purchased the ground from John Walley on July 17, 1725 for twelve pounds, five shillings. 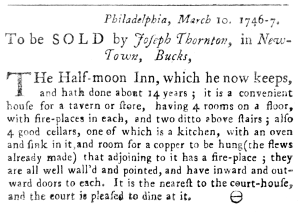 Joseph Thornton conducted a tavern here until his death in 1754, when his wife, Margaret Thornton, then took over the business until 1790. Innkeepers Margaret and Joseph Thornton operated the Half Moon Inn on this site offering meals and lodging to the people coming to the county courthouse. The tavern was located in the two north rooms of the building. In the 1890s, the local telephone company purchased the building and subdivided it into two separate units. The north side contained two rooms which were used over the years for a variety of uses, including a radio repair shop. The south side contained a private residence. The Newtown Historic Association was the recipient of the north portion of the property in 1964 as a gift from Robert L. LaRue and his wife, Ruth. The LaRues also gave $25,000 to restore the structure. The NHA then purchased the south residence in 1974 and fully restored it in 1982. After the restoration, the two doors connecting the two properties were re-opened to make it back into one building. The Half Moon Inn (Court Inn) has served as the headquarters of the Newtown Historic Association ever since and is on the National Register of Historic Places. At the present time, the south portion of the Half Moon Inn (Court Inn) serves as a reception area and includes several rooms that have been restored to their original décor. The north side contains the tavern room and the room behind it where the original Thornton family lived. 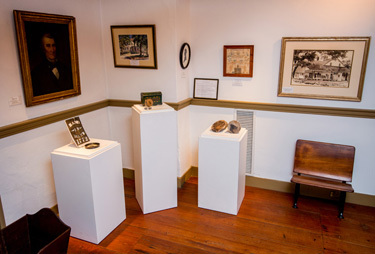 The second floor houses the Research Center & Barnsley Room of Newtown History, as well as the Edward Hicks room, along with a restored tavern bedroom. 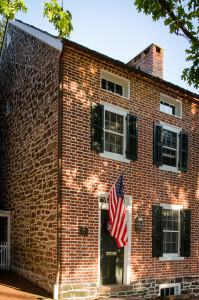 The Thornton/Hicks House was initially constructed in 1782 by Margaret Thornton as a 2 1/2 story stone residence with a brick front facing Court Street. 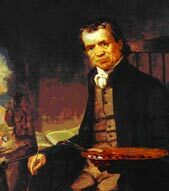 After her death in 1790, the property was purchased by Abraham Chapman, a prominent attorney at the time, and then was sold to the famed Bucks County primitive painter, Edward Hicks in 1811, where he lived until 1821 when he moved to the stone house on Penn Street. This historically significant building has not been changed drastically since 1840 when it is likely that Joseph Schofield raised the level of the roof and added the half windows on the third floor. The front facade of this building was restored in 2003 which included stabilizing, repairing and restoring the roof and attic. New period shutters, hardware and a front door were added along with the replacement of the window sashes, topped off with a new coat of colonial green paint. The Boone Garden is located directly across from the Half Moon Inn (Court Inn) on the southwest corner of Centre Avenue and Court Street. 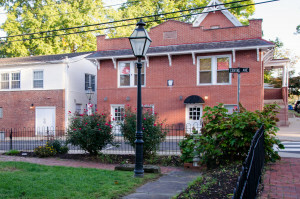 This 2,100 square foot parcel was donated to the Newtown Historic Association from the late Grace R. “Missy” Boone in 1972 for the enjoyment of the community. The Boone Garden, surrounded by a gothic wrought-iron fence, is a quaint open space in the Borough that contains abundant roses and other charming flowers that greet passers by and are illuminated at night by two Philadelphia cast-iron lamp posts that were donated by the Newtown Commoner Questers and also supported from contributions in memory of Ernest Millard, Jack Sutterly and Terry McCarty. In April of 1867, a number of prominent residents of Newtown and Wrightstown Townships applied to the Commonwealth of Pennsylvania for, and were granted, a charter to establish a turnpike road from the Anchor Tavern in Wrightstown to Newtown. This became a reality in 1870, when the Newtown gate was erected at the intersection of Durham Road and Sycamore Street, on the site where the Goodnoe Dairy Bar once stood. 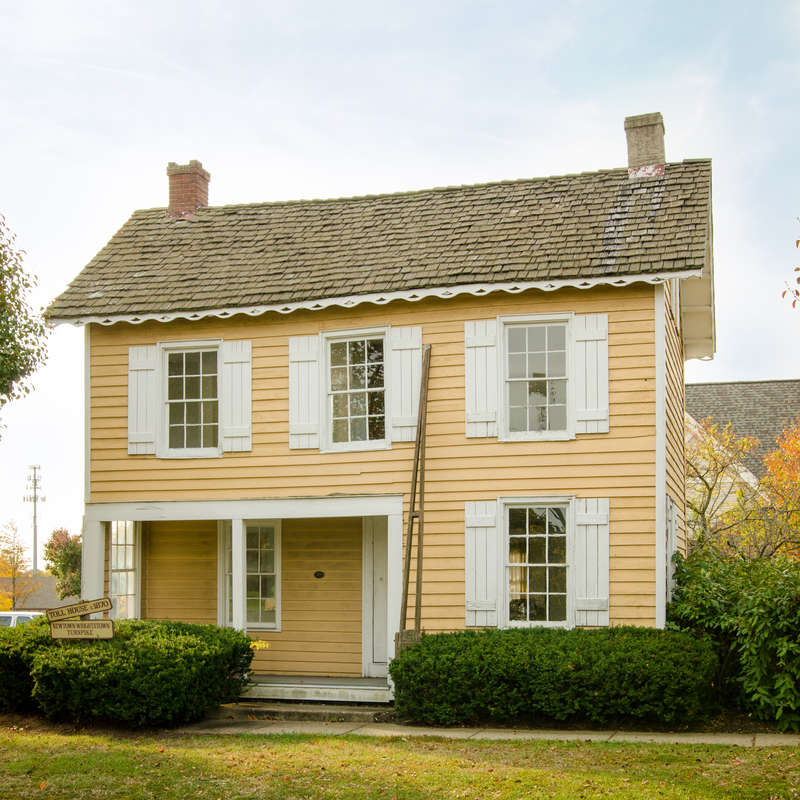 A small frame house served as both the home of the gatekeeper and his family and the headquarters of the toll gate. Upon the payment of one cent, the gate was lifted and a pedestrian was allowed to pass through. Two cents opened the gate to a horse or ox. When automobiles came into use, the charge for a car and driver was five cents. In about 1920, the Toll House ceased to function and the building became a private residence until 1955, when it was moved farther west on Durham Turnpike, opposite the entrance to Eagle Road. 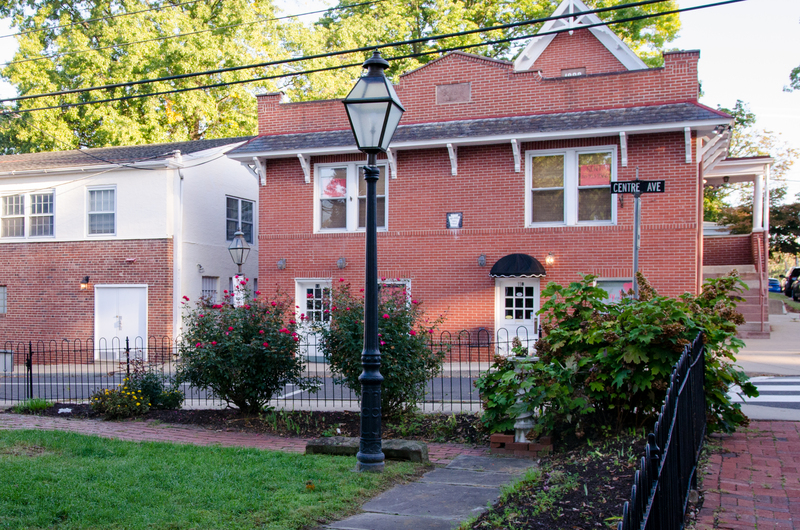 When plans were being formulated for the Village at Newtown shopping center in the early 1980s, the Newtown Historic Association, along with other interested parties, persuaded the developer to preserve and restore the property. Built in two sections, the earlier part of the house dates from 1870. The color of the clapboard siding has been matched to the original paint color. The house features a bargeboard and an unusual window on the porch. Edward Hicks (1780-1849), son of Isaac and Catherine Hicks, was a leading American folk artist, and the painter of the famous Peaceable Kingdom (Hicks painted over 100 different versions of this biblical scene). He lived in Newtown for almost forty years. The Edward Hicks Room at the Half Moon Inn displays many of the treasurers owned by Hicks during his lifetime.